watching our words: route or line? The word for the path followed by a transit vehicle is sometimes route, and sometimes line. Whenever you have two words for the same thing, you should ask why. Most of the words used in transit discussions also have a more common meaning outside that context. That common meaning often forms a connotation that hangs around the word, often causing confusion, when we use the word to talk about transit. In saying the word, we may intend only the transit meaning, but some people may be hearing the more common meaning. Regardless of our intentions, the commonplace meaning of a word is often still there, as a connotation, when the word’s used in a transit context. The words route and line are a good example. A route, in its common meaning, is the path traced by some kind of person or vehicle. When a package or message is going through a postal system, we say it’s being routed. The person who delivers newspapers to subscribers in the morning is following a paper route. School buses typically follow routes. What these meanings of route have in common is that the route isn’t necessarily followed very often. A package going through a delivery system may end up following a specific route that no package has followed before. Paper routes and school bus routes run only once a day, and not at all on some days. These common uses of route imply a place where some kind of transport event happens, but possibly not very often. The word line, on the other hand, has a clear meaning from geometry: a simple, straight, one-dimensional figure. In common usage we often use line for something curved, like the laugh-lines and worry-lines on a face, and transit lines may be curved as well. But in any case, the word line doesn’t imply an event, as route does. A line is a thing that’s just there, no matter what happens along it. Lurking inside these two words, in short, is a profound difference in attitude about a transit service. 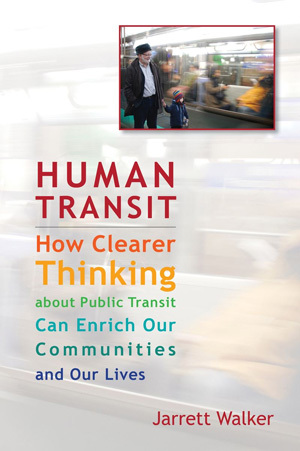 Do you want to think of transit as something that’s always there, that you can count on? If so, call it a line. We never speak of rail routes, always rail lines, and we do that because the rails are always there, suggesting a permanent and reliable thing. If you’re selling a transportation product, you obviously want people to think they can count on it. So it’s not surprising that in the private sector, the word is usually line: Trucking and shipping companies often call themselves lines, as do most private bus companies and of course, the airlines. This doesn’t mean that all these services are really line-like – some may be quite infrequent – but the company that chose the word wants you to think of it as a thing that’s reliably there, that you can count on. Use route to indicate the site of a (possibly very occasional) transportation event. The word route reminds many of us of school transportation, newspaper deliveries, and delivery systems that may operate only infrequently. Use line when you want to imply something that has a continuous physical presence and availability – for example, a transit line where service is coming so often that you don’t need a schedule. To put it even more simply, the word route lowers expectations for the frequency and reliability of a service. The word line raises those expectations. Often, transit agencies themselves will use these words in a way that’s not quite conscious of these connotations. In Australia, for example, bus services are usually routes, but rail services are lines. This usage carries a hint that we should have intrinsically lower expectations of bus service as compared to rail. In many cases, that’s not true: many bus “routes,” for example, run frequently all day while commuter rail “lines” may run only a few times at rush hour. Of course, these connotations can be a nuisance. Sometimes you don’t want any connotation. Sometimes you just want the meaning. Unfortunately, words without connotations tend to sound abstract and dull. I could insist on saying “fixed vehicle path” instead of route or line, just as I could say “nonmotorized access” when I mean walking or cycling, but you wouldn’t get through this book if I did. Language that strikes us as evasive or bureaucratic is often the result of word choices that try to avoid all connotation. Such language is precise but uninspiring, and long passages of it are just plain hard to read. To keep our speech vivid and engaging, we have to use words with connotations, and do our best to choose those connotations consciously. I’ll do that throughout this book, and note where there may be a connotation problem. As for route and line, my broad intention is to raise expectations of transit rather than lower them, so I generally use line. However, when I speak specifically of a service that doesn’t run very frequently, I use route. 41 Responses to watching our words: route or line? Looks like your book will be rather wordy! And is it aimed at a worldwide market, or just N Am? Because in the UK we don’t use “line” for buses at all. Though we do use “Service”, and I am never sure myself what the difference is between Service and Route. But it may be that Service is analagous to Line. Having said that, Route (pronounced ROOT, of course), is probably used a lot more these days. Alan. I'm writing in US English, but noting differences in usage where they're enlightening or entertaining. I'd be curious if the aversion to saying "bus line" will continue in the face of infrastructurally intensive guided-bus corridors that several UK cities are working on. LOL. I like the word “Metro”, the single most misused and totally abused word in transit! Melbourne has a metro (NOT) and Adelaide has a metro, despite the service on the Adelaide rail system being half hourly and run by diesel trains. On the other hand, “route” is often used for highway designations, which are “always there”. In the US, It’s more commonly used for things like US highways, that were frequently designated as a path over existing roads (albeit a fairly permanent one), than for Interstates, which were frequently built as new or substantially upgraded roads. The same seems to apply for transit — things that consist of substantial infrastructure constructed for the transit service get called “lines”, and situations where a vehicle traverses a path over an existing road network get called “routes”. I don’t think service frequency has much to do with it at all, as you note that bus routes can be very frequent and service on a rail line very infrequent. This is normal, not a usage anomaly. Why not let words mean what they actually mean, as determined by existing usage, rather than try to infer some hint about service quality that doesn’t really exist, and change usage based on that? If there’s any negative connotation to be drawn from “route”, it’s probably indirectness. But if you start calling meandering routes “lines”, I don’t think that’s going to change much. And, in the same vein, how about transit agencies no longer wanting to call passengers “passengers”, such as right here in NYC where, for about 10 years now they’ve been called “customers”, another Orwellian bit of newspeak. It throws out a perfectly concise word which describes exactly what the person is doing: booking “passage” on the vehicle of a common carrier. Customer is so much more vague. I think, in part, it also lowers expectations on what one can expect once entering transit property since the “passage” part is no longer in the forefront. I mean, why are you there? To admire the beautiful station rehab job? To listen to all those informative, jaunty public service announcements? To read the social service adverts? In some transit systems, there’s a meaningful distinction between fixed infrastructure and the vehicles/services which run upon them; the NYC subway is a well-known example. And the whole flexibility-vs-permanence thing can be spun in any number of directions. I tend to agree with Scott Wood above that neither term says much about frequency. Indeed, private sector bus operators like to use the world line. In Leeds, which is close to a monopoly of one private bus operator, I live between the Pink Line, which runs every 10 minutes and the Turquoise Line, which runs every 8-12 minutes. Such designation is used for all the services running about every ten minutes, which tend to be along radial arterials, while other routes that meander about the city less frequently are plain old “routes”. It is notable, however, that no one ever, ever, says “turquoise line” or “pink line”. Colour lines don’t seem to be that effective at communicating local-stop buses, that are thought of more with relation to the streets they’re on – the streets along which they’re routed, in fact. They are perhaps better left for where serious rapid bus or rail infrastructure exists. Admittedly, in Leeds it’s partly to do with streets that are thought of as one frequent corridor having multiple lines of completely different colours serving them, so I’m not whether colour lines for local-stop buses might be more successful where that isn’t the case. The buses being thought of in relation to their streets, I have a suspicion that lines named after the streets they run along would have been more effective – “Headingley Line”, “Cardigan-Queenswood Line”, “Burley Line”, “Kirkstall Line”, etc. One thing I’ve always found interesting for the NYC subway is that “lines” refer to physical pieces of infrastructure (e.g. “the Lexington Avenue Line”) whereas the individual numbered routes are generally called “services.” Not sure if this is official or an NYC railfan thing though. Scott: It’s worth noting that even US highway routes are conceptual lines drawn atop physical roads. For instance, once the interchange with 276 in NJ is finished, I-95 will take a somewhat different path along largely existing highways. In common usage, words such as “airline” or “van line” refer to companies providing mobility, not to specific services provided by said companies. The modern use of airline, etc. is likely derived from the use of “line” that Jarrett mentions–many such companies (in the US, at least) have proper names containing the plural form of the word (“Delta Airlines”, “United Van Lines”), suggesting–at some point–that “airline” did refer to a specific trip. Many long-haul transportation companies will refer to regularly-scheduled trips or specific journeys with references to the vehicle or to the gerund form of its primary verb–i.e. “Flight 101” or “Train 4”. After all, unlike transit users who may care about the particular streets their bus runs on, air travelers generally only care where the plane takes of and lands, not what path it takes through the sky. As jfruh says, “line” is often used to designate the physical structure, as in 8 Ave Line, Lex Ave Line, etc. We NEVER use the word “route” when speaking of a rapid transit line, although, interestingly enough, I have heard the word “route” used about bus lines. Generally however, when speaking of buses, we just say “bus”, as in “take the M15 bus”. About 15 years ago a particular TA president tried to enforce the use of the words “line” when speaking of the physical structure and “route” when speaking of a specific train service. It went nowhere. Much of the “official” lingo used in NYCT publications, maps, etc has been cooked up by paid consultants, often not from NY. Hence the disconnect between the way “we” actually speak and the way “they” think we should speak. I think Jarrett is correct to point out such distinctions where appropriate because all too often, words, word-pairs, terms and phrases are misused. To exemplify, media misuse of the word-pair “near-miss” is rampant. The term is used incorrectly, so much so, the wrong use is now probably the accepted use. A “near-collision” is no doubt a better way to convey the intended message or meaning one is obviously trying to convey. In the rail context, I think “line” tends to refer to the physical infrastructure, while what runs on it is a “service”, or “train” (as in “express train”, “local train”, “train to San Jose”, etc.). I think in the British context, a “route” might be one level further up, referring to the path a passenger takes through the rail network using one or more services to complete their trip. And the document which determines whether a particular ticket is valid on a particular service as part of a permitted route is a thousand-page book called the “Routeing Guide”. Route has often been used by RRs and transit in the US to indicate frequent or prominent services. Chicago Transit Authority called the north end of today’s Red Line and the south end of the current Green the “North South Thru Route” for many years. North Shore Line referred to the “Skokie Valley Route” to distinguish the inland segment. The Rock Island RR used the phrase “Route of the Rockets” on the cover of their public timetables. Their some time partner Southern Pacific used Route to describe each of their premiere services-Golden State Route, Sunset Route, Cascade Route. as well as Overland Route also used by partner Union Pacific even at one time on their corporate herald. Check this out. There once was a railroad known as the Seaboard Air Line. Go figure! @david vartanoff. Which reminds me, Amtrak’s 457-mile Boston to Washington, D.C. railroad race track is known as the Northeast Corridor (NEC), of all things! @Alan Kandel, it gets even stranger. The Seaboard Air Line merged with the Atlantic Coast Line to become the Seaboard Coast Line. And there were all kinds of railroad “Air Lines”, including the “Chicago – New York Electric Air Line Railroad”, the “Santa Monica Air Line”, and probably others. Perhaps this implied a more direct, “as the bird flies” route. I’m not sure about this one. To me, a route is a county road, or a rural state highway. To my grandparents, who grew up before the interstate highway system, it was synonymous with highway. A bus route is simply the path a bus follows. I don’t think I would ever use line in this context. Must I start now? I was under the impression that in a complex network, like NYCT, a line is a physical infrastructure whereas a route is the path a specific service takes over the line. I think it’s quite uncommon to refer to the 6 line or 1 line – people who make such distinctions use names of segments, e.g. the West Side Line and the Pelham Line. In similar vein, local buses are always routes, since their infrastructure is just the streets, but there are BRT lines. Numbered highways are routes because they designate a route following more than one contiguous piece of infrastructure. An interesting instance of a transit agency playing on these connotation is Hamilton (Ontario, Canada), where the Hamilton Street Railway (which everyone calls HSR and has long since operated bus-only transit, the street railway is history) operates “Route 10 B-Line.” This is an express line operating articulated buses on the major east-west thoroughfare in the city, where many other local services operate as well. B-Line uses “line” as well as the pun of beeline to imply speed, but curiously enough B-Line is the name of the Route (numbered 10.) The buses are even branded with B-Line painted on the side. A roughly similar set of express routes in York Region, north of Toronto, called Viva use colours but not public route numbers. Surely lines can be rerouted. It’s far from one-to-one–and an Angeleno will use either the number or the name depending on context. It is common to hear reference to “the F line” and similar in New York, in the case of service changes which are in fact referring to the physical infrastructure, e.g. “because of construction the E train is running via the F line”. This is how I would interpret any reference to a subway “line” in New York. In “How We Got to Coney Island”, Brian Cudahy notes that, when the New York Board of Transportation was services from streetcars to motor buses during the 1940s and 1950s, it used ‘lines’ to refer to streetcar service and ‘routes’ to refer to bus service. For example, “Effective March 4, 1951, trolley car service on the Flatbush Avenue Line will be discontinued and replaced by motor bus service known as the B-41, Flatbush Avenue Route.” This was at a time when bus service was being actively promoted as superior to the streetcar service. In general I would agree with Scott Wood. In modern US usage “line” refers to dedicated infrastructure and in some cases the service using it, while “route” refers to a path traced by a service through a larger network, and in some cases to the service tracing it. Using “line” to refer to a service without any dedicated infrastructure, however frequent, seems almost dishonest to me. Well I can assure you Alon Levy and Anon256, as a former TA employee, life long NYer and subway rider, that nobody here, including TA employees, ever uses the word “route” in reference to a particular service, as in I’m taking the “E” route to Queens. It is always “take the E line, or train”, as in the old song “Take the A Train.” As I’d written earlier, TA President Alan Kieper, back in the 90s, tried to force us NYCT employees to use the words “line” for the physical structure and “route” for the train service and failed utterly. Indeed in the official TA employee timetables and work programs the services are still to this day referred to as lines, as in “E” line, #7 line, etc. Want to muddle things further? There are still people here in NY who remember the three divisions, IRT, BMT & IND, whose names were used officially up until 1967, and the signage for which, much of it set in wall tiles, it took them another 40 years after that date to expunge. In fact in the Schedule Dept of NYCT, where I worked for many years, there are still three schedule sections, A, B1 and B2, or IRT, BMT & IND, and people there still use these words, despite the upper bureaucracy’s best efforts to stamp out the use of these antiquated designations. IMHO the bottom line is that in most parlance line and route are overlapping if not synonyms. The distinctions vary with both local and generational usage much as Angelenos use “the” with a freeway # but others do not. Indeed “air line” was used to indicate a more direct route by a number of railways both mainline and traction. FWIW, I have never liked “NEC” as a name for the PRR/NH Washington to Boston route. It seems this article is creating more of a distinction between “line” and “route” than necessary. In the context of mass transit within the State of California, which I realize is but a small portion of the world, each word is used to mean the same thing for buses. It isn’t even geographic; it really boils down to the agency. For example, SF Muni has lines, while SamTrans and Golden Gate Transit have routes. All three agencies operate buses in the City of SF. In another example, LACMTA (Metro) has lines and LADOT has routes. Both agencies operate buses in the City of LA. As for rail lines, yes, all rail lines in California use “line” and not “route” in their names. That seems much more definitive outside of California too. Route=Path followed by a transit vehicle. Ex. At TriMet in Portland USA, Line 19 has two different routes driven. In Chicago, we have colo(u)red elevated/subway “lines” and numbered bus “routes” which I expect is just common usage here. I will also note that I was taught very early that pigs “root” but a road is a “rout”. It may go back to Noah Webster but there you have it. In Toronto when I was growing up I believe that street cars were usually car lines whilst buses were bus routes. However trolley buses were called trolley coaches and diesel buses were buses; take the Eglinton West bus to the Weston coach. Alas trolley coaches are all gone. Now I believe it is more common to take the Queen Car and the Dufferin bus. Subways can be lines or subway, take the Yonge subway or the Yonge line.GO transit trains are lines; Lakeshore West line, Georgetown line etc. Route is never used for a highway. You take highway 401 or the 401 but never route 401. I have a feeling that this topic is the follow-up from a post I made in the Edmonton topic where I used “route and line” a couple of times. Personally, this just looks like another of Jarrett’s attempts to portray BRT as rail-like. Ottawa – that would be the city with the biggest BRT system in North America, complete with a network of dedicated busways – does not use the word “line” to describe the main Transitway routes (the 90-series routes). And when you think about it more closely, that makes perfect sense. The Transitway doesn’t just carry a few rail line-like routes; it also carries “express” (i.e. single-seat ride) routes, arterial routes for part of their routes (typically of the 80-series routes) and even local feeder routes (since someone once had the bright idea to reroute local feeder routes onto the Transitway for one or two stops, the main effect of which seems to have been to bump up Transitway usage statistics slightly). Expresses are more “line-like” in their use of the Transitway than are the inherently more “line-like” arterial routes that only use the Transitway for limited stretches. The 90-series routes themselves – the most “line-like” – even suffer from the kind of rerouting fiddling that’s usually reserved for feeder and express routes. The outer portions of these routes, once off the Transitway, tend to meander about until they or the Transitway is extended, at which point the meander is straightened out and new meanders added to the end. Given all this, how would you possibly come up with a decision rule as to what is a route and what is a line? Any such distinction has been completed blurred by the mixed-operation model used on the Transitway. And that in and of itself casts light on a different issue. One thing I’ll say about Ottawa’s BRT fanatics – they’re proud of their fanaticism. Using the word “line” would suggest that they’re trying to conflate BRT with rail, that they feel that BRT is inferior and needs to employ language of the superior mode. Nope, not here. They’re so convinced of the superiority of BRT that this kind of linguistic inferiority complex isn’t for them. They’re proud of their routes (which are bilingual with French, by the way, using the “root” pronunciation). No need to blur identities. Only the O-Train sees the word “line” used, and, if you listen carefully, you can hear a slight sneering when the BRT fanatics use it. On this one, I actually agree with the BRT fanatics. If you’re convinced of the superiority of BRT, then it should be able to stand up on its own linguistic terms without a linguistic inferiority complex. That’s what Jarrett is promoting here – a BRT linguistic inferiority complex. Jarrett’s original post didn’t mention either “bus rapid transit” or BRT–the distinction between local bus service and BRT is something that was brought up in the comments. He was speaking of bus service in general, not of fixed-infrastructure bus specifically. And “open BRT” systems like Ottawa has blur the distinction further, as you note–many busses use the Transitway and then fan out onto local streets–are these routes or lines? And do we care? That said, the discussion of “line” vs “route” is, if anything, a salvo in the flexibility/permanence debate involving different mode choices. One of the advantages of fixed infrastructure is that it is “permanent”–it represents a long-term (although not absolute!) commitment to provide service along a given corridor. The flipside of this that is that such things aren’t flexible; it’s harder to re-route (whoops) a line (doh!) which uses fixed infrastructure in response to an incident along the way, or to changing service needs in the long term. If I were to voice an objection to Jarrett’s framing, it would be to the extent that it is trying to have cake and eat it as well, and be simultaneously permanent (it’s a line! it won’t move! Honest!) and flexible. Now if there were some code of law which required a transit agency to maintain a longer-term commitment to a service designated as a “line” vs a “route”, even if no fixed infrastructure were in place, then the argument would be stronger. Absent such, we’re talking semantics, and given the widely divergent practices among transit agencies, I’m not sure the public cares all that much. Marketing and branding is important, but so is the quality of the actual service delivered. Here in PDX, TriMet calls its local bus service “lines”, which doesn’t prevent it from reducing or canceling them when money gets tight. I don’t think passengers really care anyway, they just want the bus and train to turn up and be frequent. Brisbane’s busway is really good, and people come all over the world to see it. I just wish those visitors would go visit our rail system while they are in Brisbane- they will see something very neglected, abominable service frequency (30 minutes), many stations have been upgraded, but many more others are in a visible state of decay, uncovered wooden bridges dating back to possibly 1960s or who knows when, some out buildings with visible termite decay/wood rot etc- it really is just unbelievable. There really is no excuse. Perth runs trains every 15 minutes off peak. Every day the rail commuters of Brisbane hope and pray for better train frequency. A “Route” is a path taken through and past opportunities for deviation. i.e. Following a particular route when there are plenty of opportunities to turn off that path (i.e. through intersections). For example, “Route 66” the famous US Highway was really just a specified path on various different roads and highways. A “Line” means that there’s no opportunity to deviate. This is inherent in all rail lines – you can’t make a turn unless there’s a switch. If more than one rapid transit line uses the same track – it’s called being “inter-lined”. There isn’t as much variability as “routes” criss-crossing all over the place, but the two relatively exclusive “lines” share segments. The timetables on Metro’s Web site offer other examples of the agency’s distinction between these terms. I quite like the idea of using “line” in a bus context, but to my English ears, unless it’s in reference to a different sort of service than is currently provided it sounds very odd. In Manchester (England, where I currently reside) there is a very busy bus corridor (the Oxford Road Corridor) running from the city centre to the universities, hospitals and southern inner suburbs. Countless services run by multiple private operators use part of this corridor and it has a very frequent service all day (more frequent than the Metrolink light rail lines on other corridors). By Jarret’s definition it would automatically be a line, however I’m not sure that I or other residents would happily categorise it as such. Along the the ORC the routes are not fixed or planned but semi-flexible and determined independently by the providers, ticket pricing is inconsistent and tickets non-transferable, infrastructure is low quality and services differ in terms of reliabilty and comfort. Perhaps the associations that passengers are making when using ‘line’ is that of total quality of service (frequency, reliability and comfort) rather than just frequency. Although this corridor has more frequent services than any of the light rail lines in the city, due to its other deficiencies, to call it a line is more likely to taint the word line than it is to pass its positive connotations onto the corridor. Perhaps line should be preserved for transit corridors (bus or rail) with high levels of frequency AND the level of regulation and infrastructure to guarantee an overall higher standard of service than provided by traditional route bundles? I think ‘line’ is appropriate for rail as trains run on rail lines. A bus will follow a predetermined route using the street network. In the UK the terms ‘route’ and ‘service’ are generally used. The term ‘line’ generaly came into use at the same time as simplified frequent networks came into fashion here. I don’t think you have this precisely right, though you have the concept sort of right. Let me give a detailed example from Amtrak in the US. The “Texas Eagle” *service* has a normal *route* through Springfield IL, bur runs on a different *route* bypassing Springfield when there is track construction on the normal *route*. The Northeast Corridor *line* has *services* which extend to Richmond and services which don’t. It used to have services which ran on the “Inland Route” through Massachusetts” and services which ran on the “Coast Route” through Rhode Island…. Route is a specific routing. Service is a specific set of timetabled services travelling that routing. Line is a set of timetabled services which may not all travel the same routing, but are “approximately” the same. More details: a “line” can have express & local services, or “short turn” services — a “route” must follow a specific set of stops and turn at a specific place. A “line” may combine multiple services which take different routes. A “service” normally follows a single route but may follow a different route due to detours. Nathanael. No, "route" is often used for what you would call "line," a pattern of service which itself contains further "routing" variants. I don't hear "route" as meaning the same thing as "routing." The latter implies a precision that the former lacks. Home › Advocacy › Language › Marketing › watching our words: route or line?